BASEL, Switzerland — As I discussed a week ago, Viking just named seven new river ships and did a lot of celebrating. There were nearly 20 cruise journalists in attendance and Viking made our Basel visit extra interesting by inviting us to tour their operational headquarters in Basel. This turned out to be quite the treat as it gave us insight into the depth of their operations. Executive VP Tony Hoffman led us from department to department, explaining the purpose of each. These included everything from finance to human relations to shore excursions. There was a large TV on the wall that showed where every one of the six ocean ships was sailing at any given time. There was also an employee cafeteria where the cruise line tests recipes. There was a wall displaying the necks of all of the champagne bottles crushed during the naming of the line’s longships. Décor was much like all of its ships….bright, airy and austere. Work cubicles were large and outfitted with ergonomic desks and chairs. The management offices featured wall to ceiling windows. Transparency is apparently valued here. After this tour and later in the afternoon, the founder and chairman of Viking, Torstein Hagen, entertained questions and we covered a wide range of topics, returning to his theme that Viking is simply the best cruise company going, for river and for ocean cruising. Having heard Hagen speak several times now, I can tell you he is colorful, committed and enthusiastic. 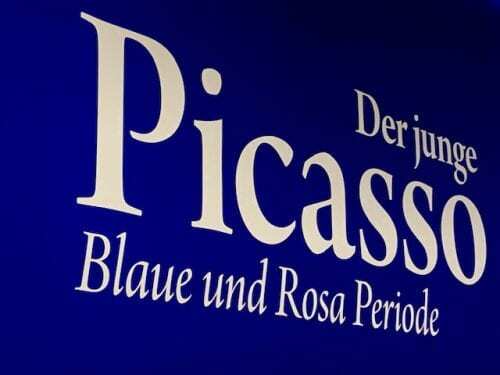 A painting by Picasso during his “blue”period. Photo courtesy of Cynthia Boal Janssens. 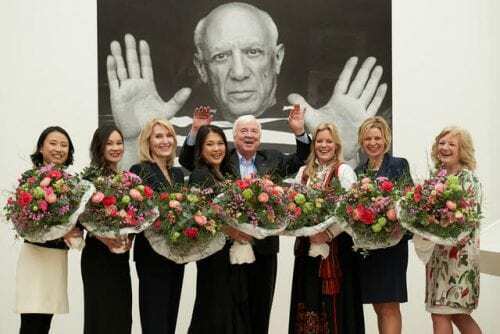 But the capper to all of the day’s activities was the evening dinner event held at the Fondation Beyeler in Basel. The museum is currently featuring a tickets-only Picasso exhibit and our group of maybe 150 was allowed total access. 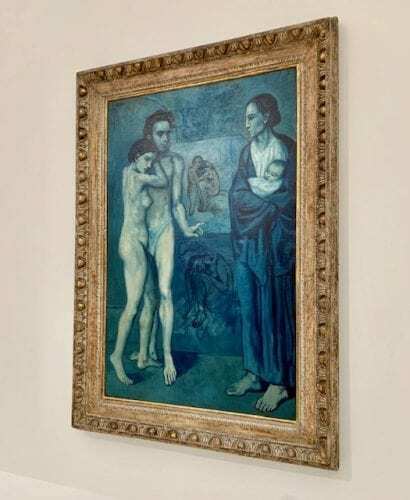 It was ever so special to walk through this carefully curated display that focused on Picasso’s blue and rose period in the very early 1900’s. Dinner was held in a lowel level room that had been converted in a Parisian bistro for this exhibit. The meal was exquisite but most delightful was the entertainment, a short concert by Alma Deutscher, a 14-year-old prodigy who performed classic works on both piano and violin, some her own compositions. (I later Googled her and discovered that she was the subject of a BBC documentary in 2017 and featured on “60 Minutes” in late 2018 for her musical abilities.) Tor Hagen has specifically requested that she be featured at our event and he certainly did not miss the mark. Picasso and prodigy in one evening. Wow! Oh, and I did not want to forget to mention that during the evening Viking gave special gifts and recognitions to the honorary godmothers and captains of its seven new river ships. It was a glimpse into a corporate culture that seems to really value its employees. Story courtesy of Cynthia Boal Janssens. Photo at top courtesy of Viking.